Provide comfort for the family of Louise Chapman Chiles with a meaningful gesture of sympathy. 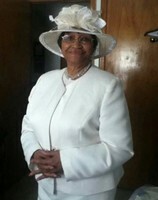 Mrs. Louise Chapman Chiles passed away on Wednesday, March 6, 2019, in Detroit, Michigan. She was born in Greenville, South Carolina, and was a daughter of the late Ira & Lula Chapman of Greenville. She was the widow of James Chiles of Piedmont, SC. Left to cherish many fond and loving memories are three children, Farrell, Portia and Stanley; one sister, Mamie Chapman Hearst of Greenville; and a host of other relatives and friends. The More Light Missionary Baptist Church, 3993 - 15th Street, Ecorse, MI. We encourage you to share your most beloved memories of Louise Chapman here, so that the family and other loved ones can always see it. You can upload cherished photographs, or share your favorite stories, and can even comment on those shared by others. The Burts family send our heartfelt condolences to you.We pray your strength in the Lord.may you find peace in knowing that absent from the body is present with the Lord. May God continue to bless and keep you. WE WOULD LIKE TO SAY HOW SORRYWE ARE TO HEAR ABOUT MRS. LOUISE PASSING. WE ARE FRIENDS OF HER SISTER MRS. MAMIE HEARST. FROM MRS. MARGARET JAMISON & FAMILY.